Welcome to the Tavern of the Taeguk Warriors’ official 2018 FIFA World Cup “Meet The Squad” series. You can refer back to this series to understand the backgrounds, weaknesses and strengths of every player of the 23-man roster. Today, part four – the squad’s three forwards. Let us know what you think in the comments below. Son Heungmin, for many, will be the only recognizable member of the KNT. But for Korean fans he’s been a “household name” for a very long time. We watched as he scored that screamer against Nigeria in the 2009 U17 World Cup; we anxiously observed as he spent his teenage years at Hamburg II; we tore our hair in frustration as he would produce moments of sheer brilliance yet disappear completely during his early Hamburg days. And now we are enjoying the peak of his career thus far – now as a Premier League star who most people who follow football would know about. Many foreign media outlets write about how Korean hopes fall entirely on the shoulders of Son. To an extent, they are right, especially with the injuries that plagued this team. On his day, he’ll create goals out of nothing (something an uninspired Korea side sorely needs). Unfortunately, this pressure seems to have gotten to his head. Especially in recent matches Son has been uncharacteristically selfish, trying to solve everything on his own and losing the ball in the process. 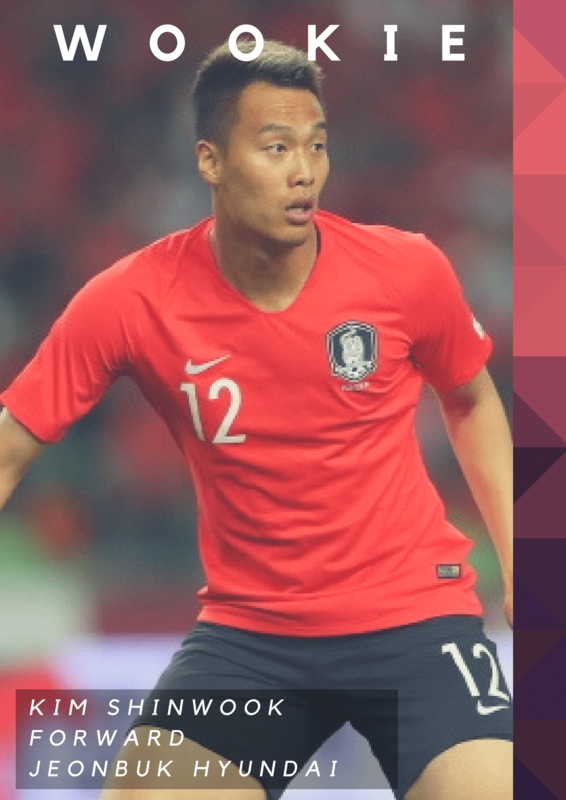 The one time Son’s individual brilliance really shone through was against Colombia in late 2017 – the one good performance Korea put up to everyone’s shock – but Lee Keunho, who was key to Son’s play, is injured. Even if Lee Keunho was healthy, Shin Taeyong is not the type of coach to stick to something that works anyway. Ultimately, Shin Taeyong has not figured out to utilitize the threat of Son Heungmin properly (and apparently asked Pochettino about it). This question isn’t new for the Korean fans. In all honesty, Son has always been a tad unconvincing when it comes to the national team. His debut came just before the Asian Cup 2011 where he wore the #11 jersey and was subbed on against Syria. He then managed to score a goal in our 4-1 victory against India and played a pivotal role in earning a last-gasp equalizer vs. Japan. Lauded for his effort back then, Son has since blown hot and cold as he often has with his club. His moments of brilliance are there – he has 21 goals in 67 appearances – but Korean fans expect Son to replicate his club form on the national team, something that hasn’t quite worked out yet. And with Korea struggling so much as of late, Son knows he needs to create. He’s the fastest player on this team; he’s arguably the best dribbler; he most certainly has the most powerful shot. But he needs to get his head up and go for the pass instead of trying to beat that extra defender. Some say Son is on the level of Park Jisung. At club level some would say he’s almost there while some would say he’s surpassed Park (depending on your point of view). On the national team Son has a lot of work to do to get anywhere near Park’s level, but if he manages to pull a miracle and carry Korea to the RO16, perhaps even his critics would vaunt him to Park’s status in KNT legend. Hwang Heechan has been considered a top youth prospect for a very long time. Videos of his crazy goals for Pohang Jecheol U15 (the middle school team) started coming up around 2010-2011. 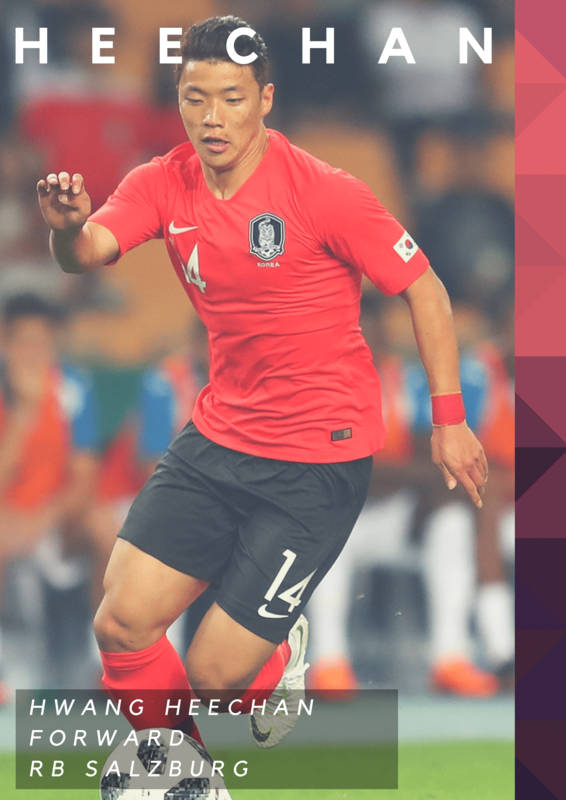 He won the Cha Bumkeun Football Award, scored a hattrick vs North Korea at the AFC U16s in 2012, and was on a trajectory to become the next K League teenage phenom. Pohang and then-manager Hwang Sunhong (a player Hwang publicly stated he wanted to emulate) had plans for this guy and offered him a pro contract in the winter of 2014. Instead, Hwang decided to fly out to Austria to negotiate a deal with Salzburg/Liefering, which drew plenty of criticism from the Korean public. And unlike most cases of Korean netizen ire, this one was rational – Hwang took advantage of a FIFA rule (some would say loophole) and abandoned ship in the middle of negotiations to go abroad. Fortunately, the controversy died down as Hwang integrated himself into Liefering and Salzburg then went onto become one of Korea’s top performers every time he adorned the KFA badge. An amazing AFC U22 Championships where Hwang solo-dribbled defenders to earn internet fame as the Lord and Savior and an equally impressive showing at the ill-fated Rio Olympics earned Hwang his spot on the senior national team. Whereas Son has underperformed to his standards in KNT colors, Hwang has lived up to his reputation. He hasn’t quite been the Lord and Savior, but he consistently displays his tenacity, his bulldog-esque drive to win the ball back, and his speedy dribbling. He charges at the defense unlike any of our other players and makes smart runs. In a team that’s often stagnant on offense, watching Hwang has been a joy. However, his play is far from polished. Despite having massive thighs and an uncharacteristically muscular build for a Korean, this man 1) falls down a little too easily and 2) cannot shoot to save his life. He also doesn’t seem to link up with Son as well as Lee Keunho. Thus, there is debate over whether Hwang should play up top with Son or play wide, where he might be just as effective. But given Shin Taeyong’s stubbornness, you can bet he will start next to Son in a 3-5-2 or 4-4-2. In short – the Salzburg frontman is crucial to the Korean offense and though there is debate over where he fits into the squad, he’s a guaranteed starter who needs to perform to keep any Korean hopes alive. Kim Shinwook is a towering 1.98 m center forward who has played his entire career in the K League – nine seasons with only two different teams. He’s consistently among the top scorers in the league too. Given his height and ~1:3 goal:game ratio in the K League, not to mention his gentle demeanor and charming interviews, you would think Kim Shinwook would be considered an invaluable option up front loved by fans and players alike. Not quite. Rather, Kim Shinwook is one of the most controversial players on team Korea. Admittedly, he’s an important presence in the squad – coaches love his personality and work ethic, and he’s a popular figure among his teammates. Especially with the injury to veteran leaders Lee Keunho and Yeom Kihun, Kim has become the leader of the K League players on the team and is reportedly an important locker room presence, perhaps justifying his inclusion. But the fact is, Kim Shinwook has been limited when it comes to his prowess as a striker. Despite his height, he’s fairly weak (against non-AFC opposition) – against more physical defenders he gets pushed around, and is fairly immobile. He’s slow footed, and he is not known for dribbling past defenders. Unsurprisingly, managers put him on for the “Plan B” of long balling to Kim Shinwook and playing off of him as a target man (which has been his role on the team ever since his national team debut in 2010). This. Literally. Never. Works. It may work in the AFC where the defending is generally weak to begin with, but just does not work with teams outside the AFC. It’s unbelievably frustrating to watch Korea forgo all its talent and just hoof the ball up the pitch hoping for a lucky second bounce. It would make a little more sense if Kim Shinwook was good in the air and if the team could cross. However, most Korean fans would bet that when it comes to crossing accuracy, an English 99th division team or even nonprofessional teams would have better crossing accuracy than Korean fullbacks (seriously, the majority of crosses into the box and even some corners end up behind the goalpost). Though every Korean fan wants to see Kim Shinwook used as a last-minute sub at best, manager Shin Taeyong has taken a liking to Kim Shinwook. Every Korea fan knows that the Korean offense can get clogged up and rendered ineffective with the Kim Shinwook Battering Ram approach – but do not be surprised to see Kim start a game or so – he does in theory have a role on this team if called upon. Challenge the Tavern! Play FIFA World Cup Games with us! Son has always struck me as a brilliant “#2”-type striker, the guy any team would want… to play off their #1 (a-la Harry Kane, or a Ronaldo/Messi et al). He’s almost the perfect guy to (sorta-kinda) go under the radar, cuz you ignore him at your peril, he’s too good and he will hurt you. What he hasn’t shown imo is that he is that #1, that he can be the focal pt of opposing defenses and still break through. And yet that’s the role he’s expected to play for SK; is this unfair to Son (not that SK has too much choice…), or in your opinions does Son have it in him, we just haven’t seen it yet? Next, I’ve always been high on Lee Seung Woo, thought the world of his talent if not necessarily his attitude (that ban still stings; what could have been, may still be?). Lee has been listed as a MF, but what are thoughts on him as an up-front guy? This post asked who might link up best w/ Son in place of Lee Keunho; how might Seung Woo fit the bill? What I know of him, he’s nifty, bold, creative, and at least in the past supremely confident. What is up Dae! So I totally agree on Sonny as more of a #2 striker being shoehorned into the #1 role for the KNT. It’s hard because he is a supremely talented player and right now is more talented than anyone on the KNT roster. He’s still growing into his KNT role, let’s hope this is his big coming out party! I honestly would back Lee SW uptop with Sonny just because of exactly what you said. I feel like they could have deadly chemistry. Hwang Heechan could drift in from the wings as that guy that no one is expecting to score and he can also drop back into the midfield to be his tenacious self on defense. Yup, in my head those 2 had preternatural chemistry haha, both coming up as teens in Europe, so I’m guessing similar tactical awareness, anticipation/movement off the ball, need for creativity etc., as well as straight technical skills. Out of curiosity, do you or anyone else know about how long it takes for 2 players to gel, like how many matches before they can “read each other’s minds”? Hopefully one World Cup training camp is enough. As a #2, he does agitate his #1’s once in a while by not passing the ball when they’re open! Son needs to be more aware of his teammates and I’m not one to expect all our scoring chances coming from him, especially in the World Cup where he will see his fair share of double teams. Shin was Lee SW’s coach at the U20 World Cup last summer. Certainly knows what he is capable of and what he brings to the squad! I’ve been going back and forth on this, and here’s where I’ve landed: I actually prefer Lee SW further back (in midfield) so that he is able to dribble, pass, and create, while Hwang is further upfield, causing pressure on D and also playing off Son, who will attract a lot of the other team’s attention. Lee SW also played more on the wing for Hellas Verona this season, while Hwang played more centrally as forward for Salzburg. Let’s all just hope that Kim SW gets very little playing time this World Cup. Also, I would be remiss if I didn’t spend one more comment shouting out Suk HJ and the forward line that could’ve been with him paired with Son. And Ji DW, who I think also should’ve been given a look for this team, even though he doesn’t necessarily help solve our tactical woes. If anyone is trying to burn time before the Sweden match, look up Ji’s goal against Bayern Munich back in October 2016. Another career gone to waste! And we’ll also miss Lee KH’s steadying presence and veteran leadership. Unfortunate injury. Why Suk Hyun Jun is not on the list of forwards is the greatest mystery to me. Can Shin Tae Young be that blinded to see that Wookie is useless? Suk Hyun Jun has shown that he can play in Europe and actually score. You are not Lionel. I definitely agree with you. I think Wookie had a few good games under Shin. Especially end of last year to early this year, bagging a few goals to of course weaker teams such as latvia etc. As for SukHJ he hasnt been exactly impressive in Troyes and his last international goal for korea NT was 2 years ago vs Petr Cech( He did score a couple in the 2016 Olympics). Although I very much prefer SHJ’s playing style to Wookie’s, I think Shin has made the right choice here. And Im not very sure with SHJ’s situation but from the beginning of his career in 2009 with Ajax, he has been with 10 clubs. thats like 1 club a year. Not too sure how much playing time and stability he has secured, that could have been a big deterrent for Shin picking SHJ. This world cup campaign is a saddening one because of all the injuries we have. Kim Jin Su, Kim Min Jae, Kwon Chang Hoon. All probably starters. And even Lee Keun Ho with his leadership and guidance. But I guess its because of these injuries, it made room for Lee Seung Woo to step up and based on the past few games, he is Korea’s most attractive player. So we might even consider this a blessing in disguise. Korea’s team in the next campaign is really something to look forward to, maybe Lee Kang In can also join the team. Lee Seung Woo’s entrance into the team makes it easier for younger players to get selected for the NT especially because he showed the country that age is just a number. As for Wizard Shin with his tricks, I really hope he knows what he is doing because the korean fans are a brutal bunch and it could be really hard for him to find another job in this industry if he comes back with 3 losses. Id really like to give Shin the benefit of doubt, he has done pretty well with the u20 squad, and he topped the Olympic Group which also included Germany and Mexico(although unfortunately losing to Hondruas in the knock out rounds). Hi KoreaKevin! This is a great comment. In terms of Suk HJ, you make a lot of really good points about him. He has always been a journeyman and has never settled with a club. He wasn’t really spectacular with Troyes, but the problem was the team wasn’t all that great either. Hopefully a move to mid-table Angers in Ligue 1 will give him some stability. I am really pulling for him to get called up for the Asian Games this September. I do want to give Shin the benefit of the doubt too.